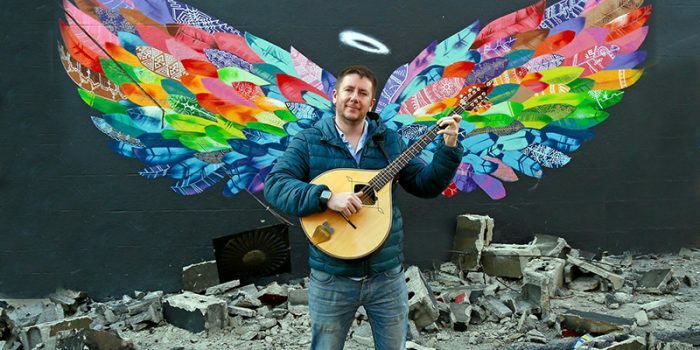 A former electrician, who decided to become a musician after seeing Christy Moore perform on Irish TV, Dublin-born traditional singer and bouzouki player Daoirí (‘Derry’) Farrell been described by some of the biggest names in Irish folk music as one of most important singers to come out of Ireland in recent years. After a promising debut album, The First Turn, back in 2009, Daoirí spent several years studying traditional music and performance at respected colleges across Ireland. While at the University of Limerick, Fintan Vallely introduced him to the singing of the late Liam Weldon, an encounter that was to prove formative to his sound and his approach to folk song. Daoirí had cut his teeth as a singer in Dublin’s famous Góilin Singers Club and at other sessions across the city, many of which he still visits regularly. Following his studies he quickly found work accompanying artists including Christy Moore, as well as a list of names that sounds like a who’s who of folk music: Dónal Lunny, Martin Hayes, Dennis Cahill, Alan Doherty, Danú, Dervish, Julie Fowlis, Arty McGlynn, The John Carty Big Band, Kíla, Sean Keane, Gerry O’Connor (Banjo), Gerry O’Connor (Fiddle), Lankum and more. In 2013 he won the All Ireland Champion Singer award at the Fleadh in Co. Derry, and in 2015 won the prestigious Danny Kyle Award at Celtic Connections in Glasgow with the line-up FourWinds. Daoirí finally stepped into the limelight in his own right, launching his own solo live career at Celtic Connections, in January 2016. In May the same year he was invited to fly to Manchester to do a live session on the BBC Radio 2 Folk Show with Mark Radcliffe just a week before his first UK tour. His name was suddenly everywhere and festival and show dates started to stream in from across the world. His long-awaiting follow-up album to The First Turn, True Born Irishman was released in October 2016. The following spring his won two BBC Radio 2 Folk Awards – Best Traditional Track and Best Newcomer – and performed with a six piece line-up at the awards ceremony at London’s Royal Albert Hall. He has since performed in Australia, Canada, Belgium, Denmark, Sweden, The Czech Republic, USA, Portugal and more and played festivals including Cambridge Folk Festival, Milwaukee Irish Festival, Vancouver Island Folk Festival, the National Folk Festival of Australia and many more. In 2018 he toured the UK with Transatlantic Sessions and recorded his next album with Dónal Lunny in the producer’s chair. His new album will be released in February 2019.